This is the way most stars end: not with a bang, but a whimper. When stars like our Sun run out of fuel, they cast off their outer layers and become white dwarfs. Most white dwarfs do nothing but cool slowly over time… but some white dwarfs still manage to go out with a bang. That’s where Dr. Robert Fisher comes in. Fisher, a physics professor at the University of Massachusetts Dartmouth, tries to figure out how these white dwarf explosions happen. 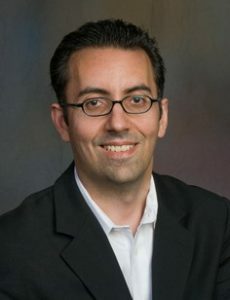 He will be giving a plenary lecture at #AAS231 on “The Fate of Exploding White Dwarfs,” in which he will discuss the mystery of Type Ia supernovae. A Type Ia supernova (or thermonuclear supernova; Figure 2) is a violent explosion caused when a white dwarf undergoes runaway nuclear fusion. These supernovae are used as “standard candles” in measuring astronomical distances—they were even used to measure the accelerating expansion of the universe! 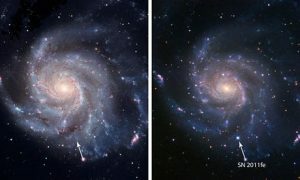 However, the actual explosion mechanism behind these Type Ia supernovae isn’t well understood. Previously, the leading model for Type Ia supernovae suggested that an explosion would occur when a single white dwarf accreted matter from a companion star and reached a limiting mass. This limit of ~1.4 times the mass of our sun, called the Chandrasekhar mass, is set by the quantum mechanics and special relativity governing the electrons in the white dwarf. Unfortunately, it turns out that this classical model doesn’t quite match observations of all Type Ia supernovae. Fisher will discuss some of these discrepancies in his talk, as well as alternative Type Ia supernova models—for instance, having two white dwarfs merge (see Figure 3), or inducing explosions in lower-mass white dwarfs. His group at UMass-Dartmouth works on computational simulations of these alternative models and compares them to observations. Figure 3. 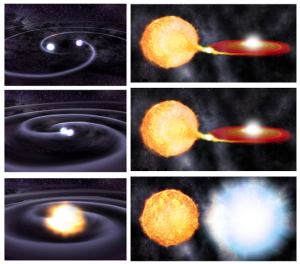 Type Ia supernova models: (Left) Two white dwarfs merging; (Right) The traditional scenario, in which a white dwarf accretes matter from a companion until it reaches the Chandrasekhar limit. Images taken from Wikipedia Commons and Discover Magazine. He didn’t settle on computational astrophysics just yet, though. During his first year of graduate school, Fisher started out in observational cosmology before deciding it “wasn’t [his] cup of tea.” He transitioned back to simulations and worked on computational models of star formation for his Ph.D. thesis. Finally, during his postdoc appointments, he started shifting to his current work on thermonuclear supernovae. Interested in learning more about Dr. Fisher’s work? Come check out his plenary talk at 11:40AM on 12th January at #AAS231!